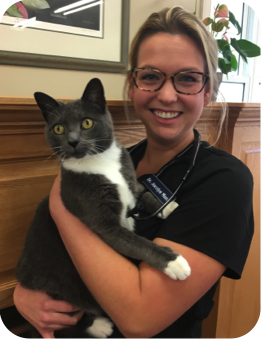 Jocelyn joined the Stirling Veterinary Services shortly after graduating from the Ontario Veterinary College in 2014. Originally from the Ottawa area, she completed her undergraduate degree at the University of Ottawa in Health Services. Attracted to the area by a network of friends, Jocelyn quickly became an asset to the Stirling Veterinary team. Many patients recognise Jocelyn's gentle manner, warm heart and infectious smile. Jocely is making roots in the Belleville/Stirling area strenghtened by good friends new and old. She loves to be outdoors running or hiking. When home, she makes time for her sweet cat Fancy and fiesty orange and white cat Charlie.